Ever since I could read, it seems I’ve had my nose buried in a book, usually having two or even three books going at a time so as to cycle back and forth depending on my mood. Since starting this blog, I have almost always had some food-related book in the rotation, along with a novel and sometimes another type of nonfiction read. Below are some of the food-related books I’ve been enjoying- they run the gamut from memoirs and travel to essays to single-subject books (cheese, wine, cod…) to books about food “politics” and even a couple novels thrown in for good measure. For a short while, I was running a virtual “book club” here, but it proved unsustainable (I should have seen that coming, since it’s hard enough to keep one going in the flesh!). However, we did have a few good discussions which are included in the links below. Even though it’s back to just me, I will continue to post my current reads and reviews, and I welcome anyone to read along with me and leave your comments. If you have a favorite food-related book to share, leave that in the comments too- I’m always looking for good reads. Unlike the familiar “American (or Brit)-in-Paris who unwittingly falls for a handsome French stranger” meme, Flinn gets her new love interest to move to Paris where, after having been fired from a high-pressure job in London, she pursues a lifelong dream of attending the Cordon Bleu. The writing itself isn’t that compelling, but the book is worthwhile for its behind-the-scenes look at a top culinary school. Anyone thinking it might be glamorous or “fun” to go to cooking school might reconsider after Flinn’s accounts of severe chefs, fish guts, rabbit heads, and 4am trips to the market. Cheryl Tan was a dyed-in-the-wool career woman who, when the stress of her job threatened to make her physically ill, decided to give it all up to travel back to Singapore to learn her family’s recipes. This adventure brought stresses of its own, but little by little Tan gains the respect of her older female relatives and learns some amazing recipes in the process. Memoir of chef/owner of NYC restaurant Prune. Hamilton gets a lot of comparisons to Bourdain for her no-holds-barred, often gritty tales of her haphazard culinary education. Her somewhat bizarre personal life adds confusion but keeps the story moving. At the end, I didn’t feel I really understood her at all; still a good read, though. I picked this up at the library because as a member of a so-called underground food group the title called out to me. The political parts may be a tiny bit outdated by this point, or just stuff I’ve already read elsewhere (it came out in 2006), but was mostly interested in reading about Katz’s travels and involvement with small upstart groups around the country (whom he met while writing his other book, Wild Fermentation: The Flavor, Nutrition, and Craft of Live-Culture Foods, another book on my eternal wish list!). Engaging and lighthearted history of Chinese food in America, written by a first-generation Chinese author. The book begins by talking about the history of fortune cookies, but expands to such topics like patterns and history of immigration, what life is like for Chinese restaurant families, and a search for the “best” Chinese restaurant in the world. I’ve had my eye on this book ever since it came out. Can’t wait to dive in and learn about authentic Sichuan food. Dunlop was the first foreign student at the Institute of Higher Cuisine in Chengdu and her cookbooks on Sichuanese and Hunanese cooking are well-known in the U.K.
Sanders explores the lives of three winemaking families in the area around Cahors (very near where I lived when I was in France). Each family embraces a different philosophy and style in their winemaking and business approach. Looking forward to learning more about one of my favorite grapes, Malbec. Yes, this is a children’s book! I have a small collection of children’s books set in France (why, I don’t know, since I have no kids… just something that appeals to me) so when this came into Book Beat it was set aside for me. The food tie-in is just an extra bonus. I’m really looking forward to delving into a non-Western food memoir- this promises to satisfy my love of food writing and my desire to armchair-travel to an exotic, sun-drenched locale in the middle of February! Can’t wait to see what great recipes are included in this book. I saw this in the library the other day and grabbed it because it reminded me that I’ve never read anything by this celebrated author. The essays in this book (most of which originally appeared in the New Yorker) document Trillin’s enthusiastic quest to sample regional specialties such as Louisiana boudin and Galician pimientos de padròn. You may have heard of Muriel Barbery’s second book, The Elegance of the Hedgehog– it was an indie bookstore favorite when it came out in the States a couple years ago. This, her first book, takes place in the same Paris hôtel and features a dying gourmand (I wonder if he was modeled after Curnonsky?) in search of the ultimate elusive flavor. I’ve been really into learning about cheese and cheesemaking lately, and was excited to get my hands on this book. Liz is a true example of “Do what you love, the money will follow”- she quit a “real job” in 2002 to work behind the cheese counter ay Murray’s in New York for minimum wage, and has worked her way up to Vice President of the company. The book is about Liz’s journeys tracing the tradition of American cheesemaking. It’s been a while since I read a food history book, and this one promises to be a treat, with ratings of 4 1/2 out of 5 stars on both Amazon and Powell’s. Kurlansky discusses how cod was a major force in shaping historical events such as the Europeans setting sail across the Atlantic, and brings us up to the present day, as fish stocks across the world are in crisis. He also includes recipes from various countries. I may just be inspired to make bacalao or brandade after reading this… mmmm. I read this last summer, but many book club members wanted to read it and I certainly don’t mind revisiting it. I’ve loaned this book out at least two or three times so far, and wish I could get everyone I know to read it. It’s shorter than Pollan’s other books, and his thesis is easily digestible (no pun intended!). He sums up the premise of his book in three succinct sentences: “Eat real food. Not too much. Mostly plants”. He also discusses diet fads and the “science” behind nutritionism. A couple months ago we had a blogger event featuring foods from Julia Child’s Mastering the Art of French Cooking. I read Julie and Julia just prior to the event, but have also been wanting to read this book, a memoir of Julia Child’s experiences as a new wife in a new country. The book takes place in the years following WWII, from 1948-1954. This book covers two of my major interests, cooking and France, so I’m really looking forward to it. I spotted this in the library on the New Releases shelf and it interested me because, although I don’t have kids, I always wondered what the process of feeding them would be like. Matthew Amster-Burton is a Seattle food writer and stay-at-home dad who chronicles his experiences trying to make an “adventurous eater” of his daughter, Iris. The book is laugh-out-loud funny and full of the kind of amusing pronouncements that can only come from a three or four-year-old. Even if you’re not currently a parent of young children, this is still a breezy and very entertaining book with some great recipe ideas. I came to this book a little late, but was glad to have eventually read it. It dovetailed nicely with reading My Life in France and participating in a blogger event featuring recipes from Mastering the Art of French Cooking (see above). It was also interesting to get a glimpse of the “early days” of blogging! I’m in. THX for the invite. I Love to read! I love to learn too. This sounds like an interesting book. My blog goes live tomorrow April 27th I am new to all this. Having a lot of fun getting to know everyone online. If I can lay my hands on a copy in time, I’m in. I’m in, this sounds way too fun! I’m in too! 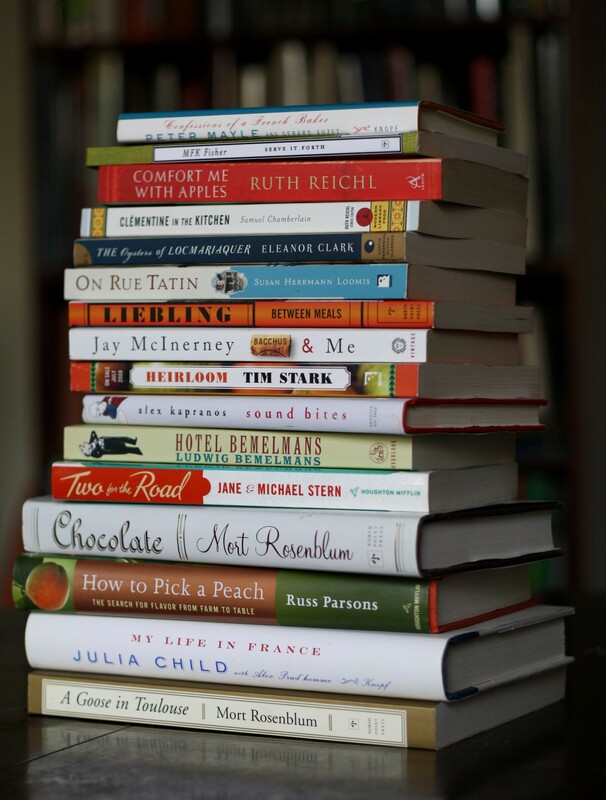 nice – but intimidating – shot of a stack of books – reminds me of my to-read list. I’ve got my copy of the book and have started reading it–great so far! Yeah! I got my book today. I’ll be reading it over the next few days. I just tweeted about your book club! I really did mean to get started on this book. It’s a bit late to get it read at this point. Count me in for next month, okay? Sounds like fun!! I’m in, I’m about to email you. YAY, I have been waiting for something like this! All I read these days is cuisine books, but even though I read every day I am still a VERY slow reader. I hope I can finish them in time! I love this idea so much! E-mailing you. Just got the next two book.! Can’t wait to start them. Shoot me an email, I’d love to have you write for a section on my blog! What a great idea! Hopefully I can get this from the library in time.